Intel Celeron M 1.5 ghz cpu 1 GB of Ram And a really crappy, and extremely long named Intel onboard piece of crap GPU. I recommend the Escape Velocity series (not exactly a simulator...more like, science fiction RPG-Lite...but I guarantee you'll like it) or Navyfield (naval combat game). Escape Velocity Nova - Wikipedia, the free encyclopedia NAVYFIELD Community Site EV Nova requires you to pay after 30 days, but that might be enough time to get your new computer running. Navyfield is free, though you can pay and get a bonus on XP. Oh yeah, and EVN is singleplayer, Navyfield is almost exclusively multiplayer. 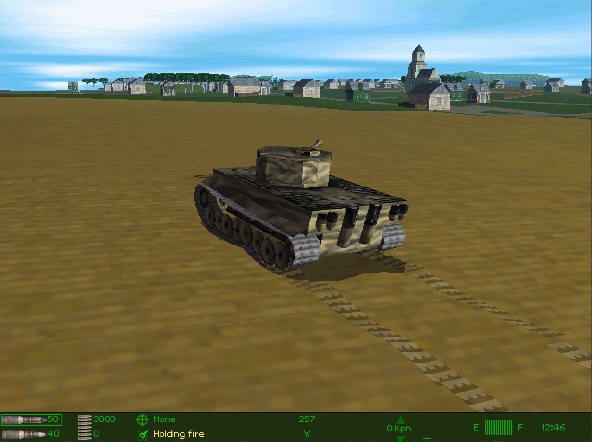 Unfortunately I don't know of any good tank simulators...At all. I'd like to hear a few too. Here are a few tank sims I've found so far. Then there's Steel Beasts which features the M1A1 and the Leopard 2A4. Armored Fist 1-3 pretty much are just about the Abrams. All of these games seem fairly "old" in the computer gaming sense so you could probably easily run most of them then the rest is up to your own personal preference. Hmm Steel Fury looks pretty good too. I might pick this one up. -------------------- Edit: ---------------------- Ok it might not run on your laptop. Sorry. You were asking for a simulator. I haven't seen one since the release of BF1942, I gotta admit. But the laptop isn't that bad at all, I think. You might not be interested, but let me suggest some games. At first: Need for Speed Most Wanted Screenshots, Patches, Need for Speed Dedicated Servers NSMW Server You can download a demo there to test your system performance. Well, you didn't ask for it. Hearts Of Iron 2...gah kill me now, that game was so confusing, I couldn't even build a tank! There's an old one that you guys have probably never heard of, but I still play because its still fun, called Forgotten Hope. Its a mod for Bf 1942, and I think it was in version 0.7 last time I checked. Great community, lots of maps. All the jerks and other unwanted characters left to go play FH2, but the best people are still left. I run it on 1.8 ghz and 1 gig of ram at the highest settings, so you should be good.